As some of you know, one of our own, the lovely Mercedes M. Yardley, has been on bed rest for the past six weeks or so, and she’s been away from the Internet for a little over a week. The reason for this can be read here. I spoke to Mercedes today. (Freaked her out at first, I think. She wasn’t taking to my fake weirdo-redneck accent.) She’s home now, still on bed rest (can’t sit up at all), and is still unable to get online. Though I think I gave her some workable ideas on how to rectify that. Apparently, when she was in the hospital, she was having contractions every two minutes. Amazing that doctors can reverse that. The doctors did an amniocentesis and removed a lot of fluid, so that relieved some pressure, which was partly the cause of the contractions. Plus she’s on steroids to help further suppress the contractions. And if you need a little more for your Mercedes fix, she was recently interviewed by Jamal W. Hankins, which you can read here. 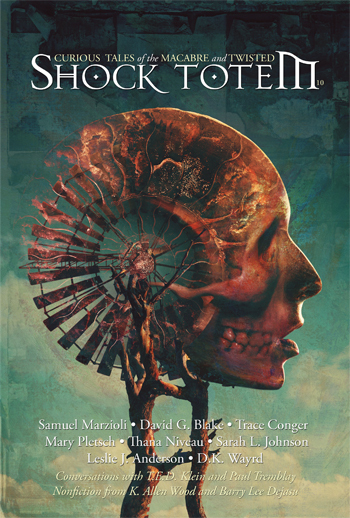 Oh, and she says she met a nurse in the hospital who was a fan of Shock Totem. How cool is that? This entry was posted in Interviews, Staff News and tagged Interviews, Jamal W. Hankins, Mercedes M. Yardley, Shock Totem, Shock Totem Family. Bookmark the permalink. I hadn’t heard about this. Best wishes to Mercedes and a speedy, safe recovery! Yeah, hopefully all goes well. As well as can be, anyway. She’s got a dark section of road ahead of her. Giant hugs for M and a small one for the nurse.